January 24th is National Peanut Butter Day; March 1st is National Peanut Butter Lover’s Day. April 2nd is National Peanut Butter & Jelly Day. We’re obviously a PB-loving nation. It won’t take you long to make this PB…and B…and B sandwich. That’s peanut butter, bacon and banana. 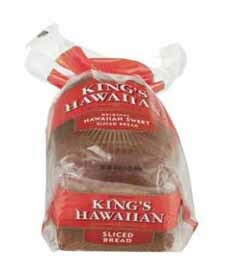 The recipe comes from King’s Hawaiian, one of our favorite supermarket breads. It’s slightly sweet, a cousin to challah. The recipe was developed by Chef Neens from Ono Yum restaurant in Carlsbad, California. Here’s our review of King’s Hawaiian bread, a NIBBLE Top Pick Of The Week. You can make a two-slice sandwich or a triple decker (photo #1). It’s even more fun if you have a large round cookie cutter, but you can make these sandwiches old style (just regular slices of bread). Prep time is 10 minutes, plus 5 minutes to cook the bacon. 1. CUT circles from each slice of bread. This de-crusts the bread for a great presentation, as well. 2. SPREAD the peanut butter on the bottom slice, and add the chopped bacon. 3. SPREAD the mashed banana evenly over the top slice. If you’d like a third layer, spread more peanut butter on the top slice, with any leftover bacon or banana. Stack and enjoy with a side of fresh berries. Have you made a PB & B & B sandwich before? It’s easy…and so yummy (photo courtesy Kings Hawaiian). 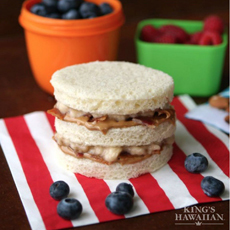 This slightly sweet bread adds a lift to your PB sandwich (photo courtesy King’s Hawaiian).